Last year Tess Thompson Talley flew to South Africa for a hunting safari where she took the life of what she called a "rare" black giraffe. 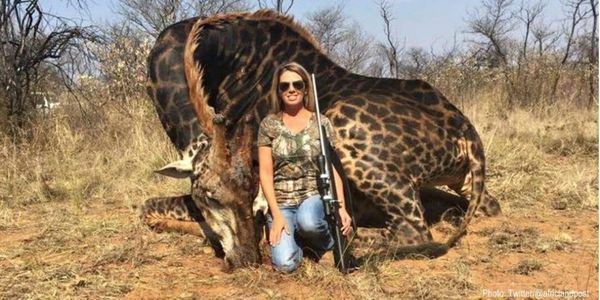 But it wasn't until recently that people noticed her sick trophy hunting photos on Facebook. Now animal lovers, conservationist and environmentalists alike are outraged. People want to know how anyone can get enjoyment from taking such a majestic creature. In the photos, Tess proudly poses in front of the giraffes barely dead body. It's a truly disgusting sight. Giraffes are currently considered a vulnerable species. In fact, according to a 2016 survey, there are less than 100,000 of the animals in the wild and over the last generation, almost 40% of the species has been lost. But because few people have sounded the alarm, many have called their slow disappearance, the "silent extinction." These animals, like elephants, rhinos, and lions, despite their vulnerable or endangered status, are legally hunted in South Africa. Trophy hunters argue that their activities and the money they pay to take big African game actually creates an incentive for locals to protect these vulnerable species. But according to a recent study by the the International Union for Conservation of Nature "trophy hunting, contrary to the common view, not only is having negative impacts on wild populations but that there is also an extremely close link between legal hunting and poaching." If that is the case, then why do countries like South Africa continue to allow these animals to be killed? It's time South Africa put an end to this horrible practice and create policies that actually protect their unique animal species. Please sign the petition and ask South Africa to ban trophy hunting once and for all.